Climb to the top of a life-size Tyrannosaurus rex for an up-close view of its teeth at this real-world Jurassic park. 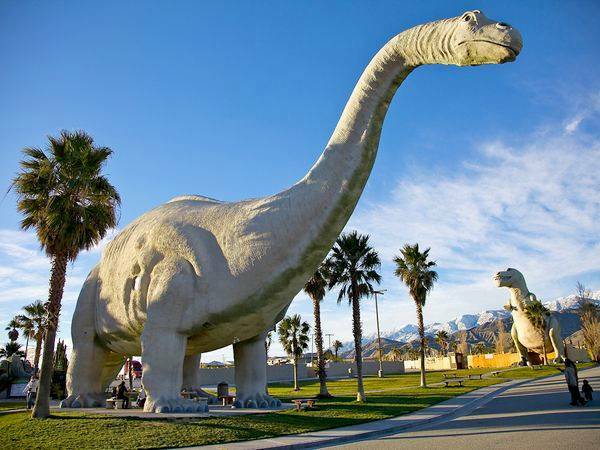 Purchase souvenirs at a museum shop located inside Ms. Dinny, a 150-ton Apatosaurus considered the largest concrete dino in the world. 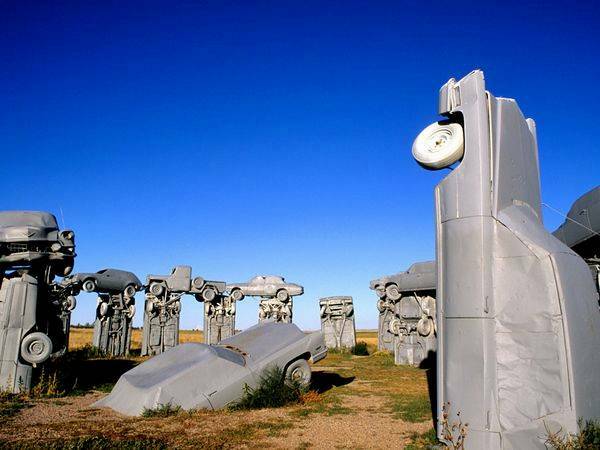 Circling a patch of lonesome prairie, 38 old cars painted gray form a replica of England’s Stonehenge. Additional sculptures made from Detroit iron include “Ford Seasons,” representing seasonal changes to the landscape. 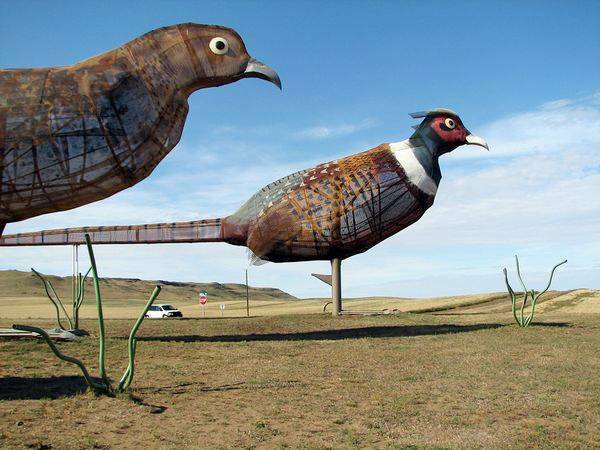 Seven sensational scrap metal sculptures line this 32-mile stretch of highway in southwest North Dakota, including artist Gary Greff’s massive “Geese in Flight,” listed in the Guinness World Records as the world’s largest scrap metal sculpture. 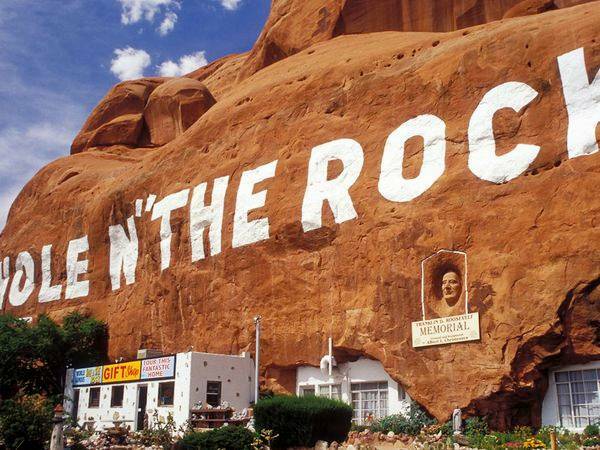 Walk through a modern cave home with 14 furnished rooms carved out of Utah sandstone. If the excavation, which removed 50,000 cubic feet of stone, doesn’t move you, take in the petting zoo. 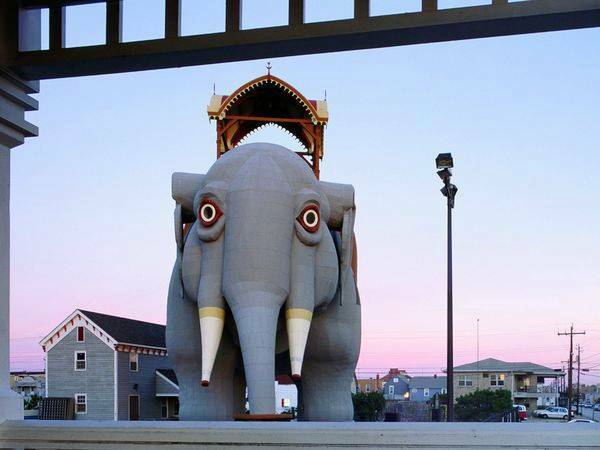 America’s oldest example of zoomorphic architecture, this 130-year-old, 65-foot pachyderm is actually a building that once served as a summer cottage. Lumber up the spiral stairs to Lucy’s towering howdah for elephantine views of the Atlantic Ocean. 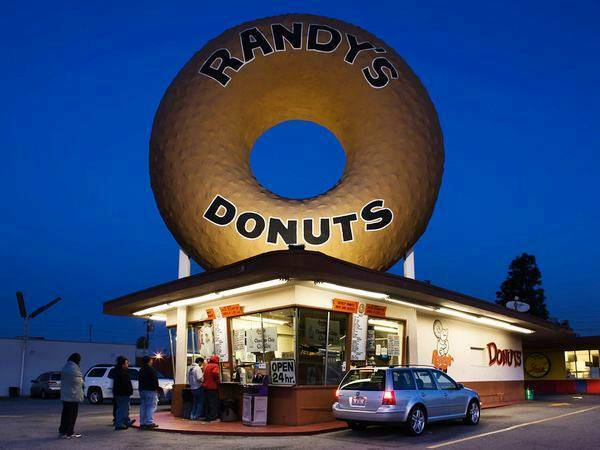 This towering donut, built in 1952, has earned celeb status by appearing in films (Mars Attacks! ), videos (Randy Newman’s “I Love L.A.”), and Hollywood dreams of sweet treats. 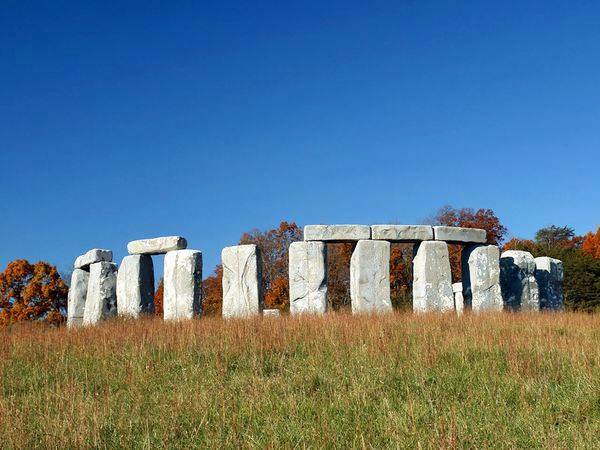 Even a Druid would feel at home at this stoic Stonehenge replica, set on a tufted hillside in the Shenandoah Valley. Baffling perhaps, but the towering industrial foam blocks make for a mystical roadside diversion. 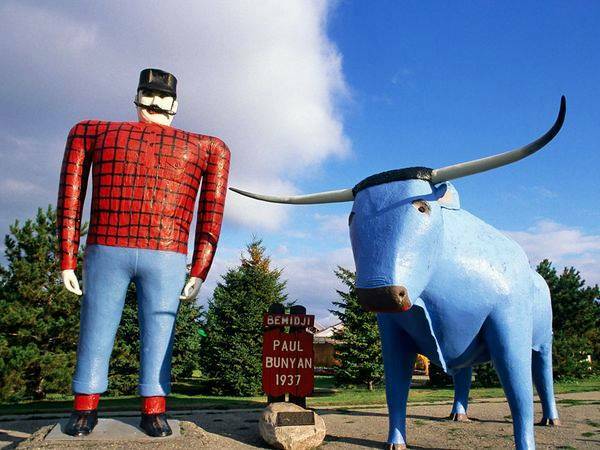 Mitchell, South Dakota may be a small town, but it sure has a lot of one thing: corn. So in 1892 when the town was trying to lure more farmers to their corn-friendly state, they decided to build a castle in honor of the starchy veggie. 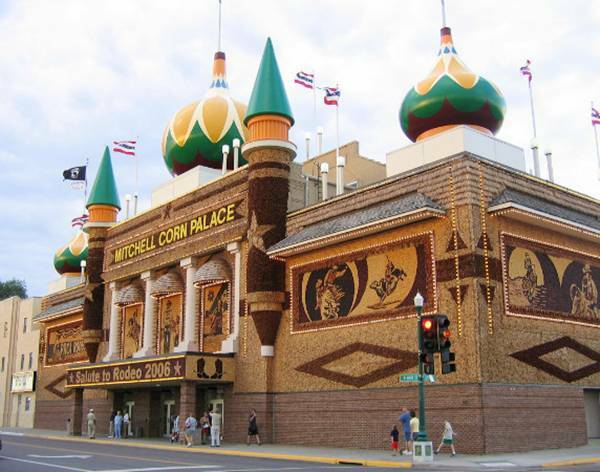 The Corn Palace started as a simple wooden structure on Mitchell’s main drag, decorated with folk art made from corn husks and kernels. Today this “palace” still exists, and has had a pretty interesting evolution from the initial building. The exterior of the Corn Palace is decorated every year with a new theme by local artists and the building serves as huge tourist attractions, bringing in half a million visitors a year. 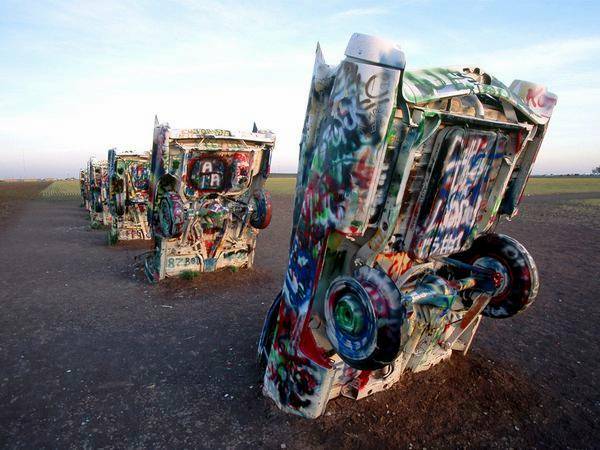 Created in 1974 by a group of artists, this graffiti-spattered homage to American road travel breaks the dusty Texas horizon with the force of an 18-wheeler. The ten half-buried roadsters, slanted in a perfect row into an Amarillo cow pasture, have been featured in movies and referenced in songs.